A FAMILY is homeless after a Brunke St house was destroyed by intense flames today. At about 10.30am firefighters were called to the address and found a two-storey property engulfed in flames and billowing with smoke. 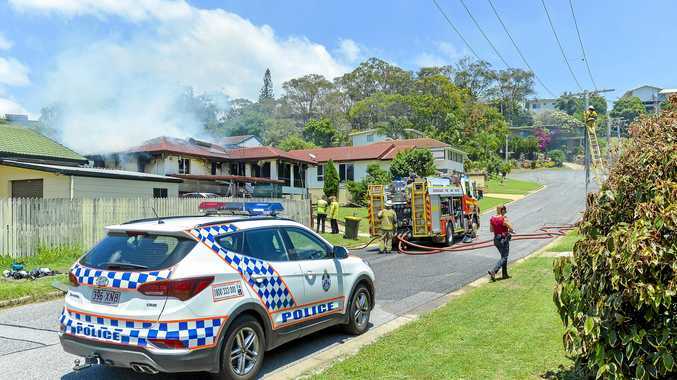 Police attended and closed Brunke St and adjoining Charles St.
Fire officer Simon Pearson said the fire started in a bedroom at the rear of the house. "We entered through the front door... and did a primary search (of the property)," Mr Pearson said. Emergency services did not initial know if anyone was inside the building but soon after a mother and child were found safe and well at a property across the road. No one was found inside the burning building. The fire was brought under control but the building could not be saved. "The house is pretty much fully gutted inside," Mr Pearson said. "There's not a room without any damage." Emergency services managed to contain the blaze within the property's boundaries and neighbouring properties were not put at risk. Mr Pearson could not comment on the cause of the blaze, but police later deemed the fire as non-suspicious. He reminded residents to ensure their homes were fire safe. "Make sure that you have working fire alarms in your house," Mr Pearson said. "They're going to give you the earliest warning if you have a fire and give you the best chance of getting out of the house." Friends of the family have set up a GoFundMe page, with the aim of raising $20,000 for the mother and her three children.